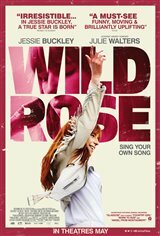 Young single mother Rose-Lynn Harlan (former musical reality talent show contestant Jessie Buckley, who came in second on the BBC show I'd Do Anything), 23, lives in Glasgow, but dreams of becoming a country star in Nashville. After spending a year in prison on drug-related offences, Rose-Lynn goes home to her mother (Julie Walters), who has been taking care of Rose-Lynn's two young children. Rose-Lynn is indifferent to her kids, seeing them as an impediment on her road to stardom.